IV therapy, often referred to as vitamin infusion therapy, offers the unique ability to replenish the body’s micronutrients when the limitations of oral supplementation and diet cannot achieve a therapeutic dose. While whole foods and optimal nutrition are the best medicine for overall health, sometimes our diet cannot keep up to the demands of our lifestyle. For many reasons such as environmental toxicity, chronic stress, increased metabolic demand, or a decreased ability to absorb nutrients from the digestive tract, the body can require higher doses of nutrients than can be delivered by mouth. IV Therapy is an investment in your health and performance. At IHI we believe in proactive performance based medicine. Vitamin infusion allows your body to access the nutrients it needs to recover and perform optimally at a cellular level. Improving cell function and cellular communication has an impact on all of your organs, tissues and body systems which is why IV therapy is used to support a wide variety of symptoms and conditions. IV therapy refers to high doses of micronutrients such as vitamins, botanicals and amino acids administered directly into the blood stream using a standard IV administration set. Most treatments last 30-60 minutes and are offered weekly for 6-12 weeks. Treatments are performed in the comfort of our IV suite. If you are a new client, our initial consultation will include a full Naturopathic Intake, health history, physical exam and lab work to ensure that we treat you safely and that IV therapy is the most effective therapy for your health goals. This appointment is 1.5 hours in length. If you already see one of our Naturopathic doctors this session can be run as a follow up visit since we have already taken your health information into consideration. Once we review your lab work you are welcome to start your IV treatment sessions. 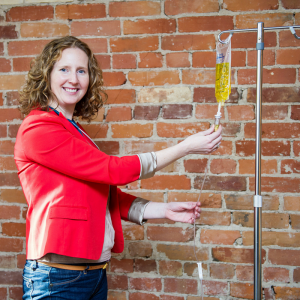 IV vitamin drip takes place in the comfort of our IV suite. Sessions can be booked with our front desk staff and typically require 30-45 minutes. However, session length varies based on the IV volume and you will be advised of your treatment length after your initial consultation. We encourage you to relax and enjoy your treatment session with your favourite music or a great book and of course you are welcome to get caught up on your email. What can IV Therapy treat? Naturopathic Doctors who utilize intravenous therapies in their practice must complete additional training and rigorous examinations prior to receiving a license to practice IV therapy. While IV therapy is not without risk it is a very safe therapy with minimal side effects. The most common side effect is irritation at the injection site. Some patients may experience low blood pressure or lightheadedness after the treatment, but these typically last only a few minutes. A taste of vitamins in the mouth is not uncommon but this diminishes quickly after the treatment. Your Naturopathic Doctor will review any potential side effects prior to your treatment. For more information please feel free to book a complimentary information session with one of our Naturopathic Doctors by clicking here or calling 416-260-6038.